Converting a site from a state where traffic is trickling in from very few sources to a site that now receives thousands of unique visitors a day, and helps tens of thousands individuals and families a year is purely something take take pride in. Intrigue has been chosen to market ALS Forums to not only drive awareness, but to target those who have been in any way associated and/or affected by the disease. Our team was able to instantly make an impact by implementing unique Search Engine Optimization techniques and using other useful target marketing ideologies. Our experienced staff effectively trained an inspiring man, who is diagnosed with the disease, to effectively manage the forums and be a real important part to the whole ALS community. 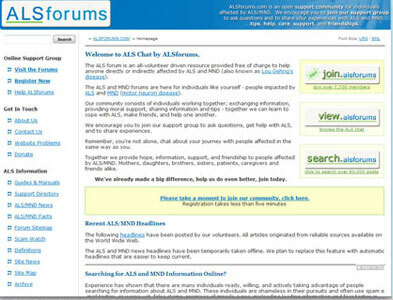 ALS Forums grows bigger each day and has become a home to thousands in Canada and worldwide.